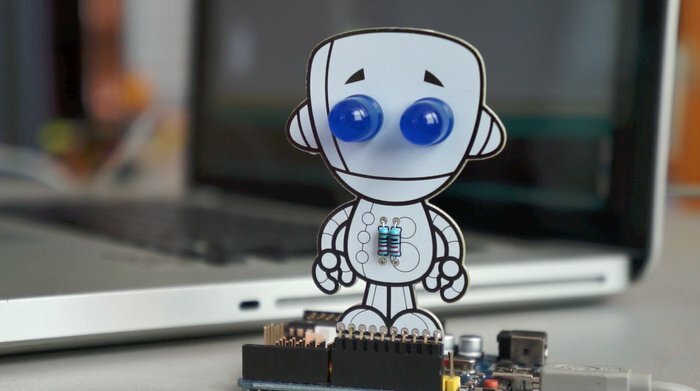 The team over at Soldering Sunday, based out of Highland Park, New Jersey (USA) are known for representing and educate the beginner community by creating kits that are not too simple, complicated or expensive. CHIP was just launched on kickstarter.com - an electronic kit basic enough for beginners but advanced enough to interact and play with. Many soldering kits do not offer anything more than a battery and a LED. Once completed, those kits end up in a drawer, never to be used again. At the other end of the spectrum, there are electronic kits that are really interesting but have so many parts that they are intimidating for beginners. That is why we designed Chip to be simple to assemble and interactive when complete. The kit comes with a number of colored LED's, resistors (220&ohm;), buttons, slide switch, coin-cell battery holder (battery included) and headers for connecting the completed setup to the Pixel Power battery board or other solutions for more advanced projects (ie: Arduino). The final result is an interactive toy a child can play with, pressing buttons to turn on or off each of the characters eyes - much better than playing with Barbie or GI-Joe dolls which are so last century. In the video on the campaign you can see how much fun the children have. The team also has plans to introduce additional "personal character" units (which they label as Pixel Pals) that could make this kit more creative and fun - each Pixel Pal will have their own personality and functionality potentially using additional electronics components. It looks like a great little starter kit for children that has use after the construction phase.